The past few days I’ve been getting some random hits on my design portfolio from Mobile Safari, the browser on the Apple iPhone and iPod Touch. Unfortunately, the content of my portfolio is displayed through a flash slideshow, which doesn’t work at all in Mobile Safari, so visitors would just be getting a blank white page. The last couple nights I threw together an iPhone/Touch optimized version of my portfolio. 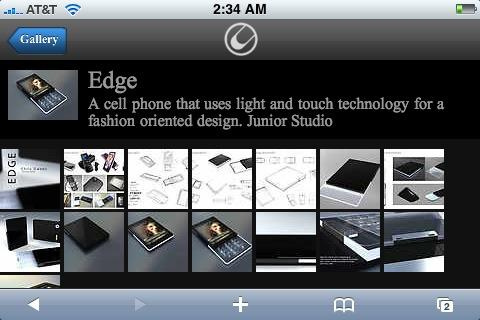 It will automatically load if you go to design.ocell.net on an iPhone or iPod Touch. There are some tweaks I’m going to keep making, but I’m pretty happy with it so far. At least I have a mobile copy of my portfolio with me at all times now and I don’t have to worry about syncing changes manually. If you’re using Firefox or Safari, you can manually invoke the interface on your desktop by going to http://design.ocell.net/iphone/, and you’ll at least get a rough idea of how it works. This is all thanks to SlideshowPro Director and iShowPro. The Chicken and the Egg analogy has long served as an apt illustration for problems of technological deployment. A recent thread in the NC State Mac Users’ Group (PackMUG) mailing list brought this analogy to mind. However, the situation in the thread, I believe, has a solution that doesn’t require faith in a higher being or a degree in evolutionary genetics. The thread started with a call for NC State University to follow Duke University’s lead with the deployment of iPods to school students. There have been multiple stories on Duke’s iPod program recently, and a quick search through Google can surely turn up news much more comprehensive than anything I can provide. From what I’ve gathered, though, the first year pilot of the program wasn’t as successful as hoped for. The school is not ditching the effort by any means, but are refocusing the initiative to a selected group of classes while iPod distribution has been extended to all students, instead of just sophomores. The PackMUG thread started with a decree that NC State needs to get the wheels set in motion to provide every student with an iPod as well. I have found the resulting discussion very interesting, and very exciting. First of all, it seems that the main lesson to learn from the Duke program is not new… content is required to drive technology. Apparently a large number of Duke students have had no utility for the iPod as far as school goes. So how should NC State respond to this information? Instead of putting iPods in the hands of all students, NC State needs to provide easy ways for faculty and students to produce electronic content. One program attempting to do this is Wolfcast. Wolfcast is a service currently available to faculty that makes it easy to produce and distribute audio recordings through RSS feeds. It’s a podcast. You supply your audio file to Wolfcast, and it wraps it up in an RSS feed that is hosted on the Wolfcast server for you. There are currently a few professors recording their lectures, and then making the recordings available to students through Wolfcast. In the future, Wolfcast should be extended to host feeds of more than just audio, like video and software. The goal is to extend this service to students in the future, and present it as a tool for everyone in the university to utilize. The beauty of pushing content services early on is that students are able to use technology they already have to become dependent on the content. A podcast (despite the name) does not need an iPod to play… it can be listened to on any MP3 player, a computer, and even some cell phones. An interesting statistic presented in the PackMUG thread is that 90% of college students have a cell phone, shouldn’t we be pushing content to a device almost every student already has, instead of spending hundreds of thousands of dollars giving them something new? Wouldn’t it be a mistake to deploy a single device, such as the iPod, and then develop content that requires that specific device to function? Instead, we can push electronic content that can be consumed across a broad set of devices. In this respect, I think Duke is being narrow minded and making a big mistake by pushing the technology before having the content to fuel it. Of course, it’s hard to miss Duke’s true motivation in the iPod initiative. It provides instant publicity for Duke and Apple as being progressive in merging education and technology, even though they are not going about it in the most productive way. These are my thoughts on the subject, and I’ll admit I haven’t looked at it from all angles. Please feel free to contribute by posting your thoughts in the comments!